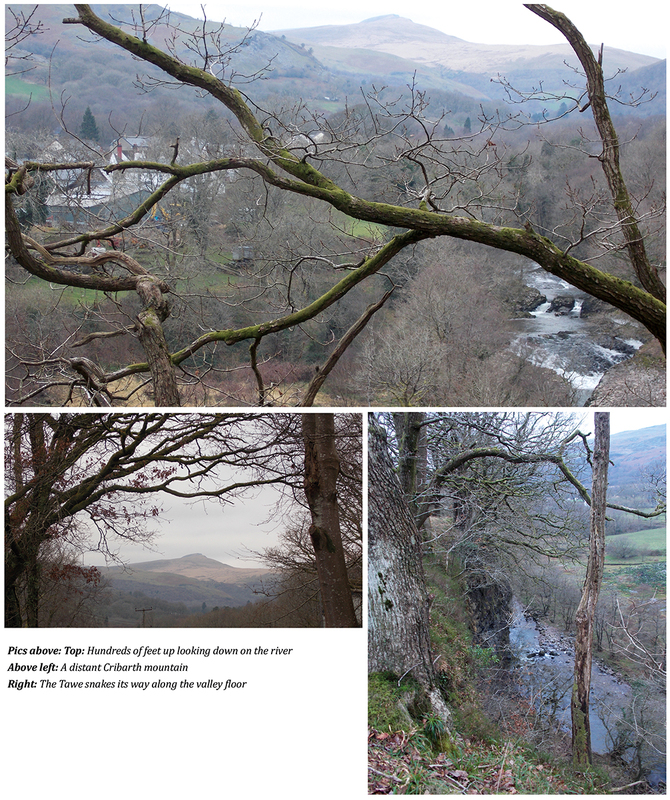 Here it is, the second part of the Source of the Tawe walk started by Ian in our last winter issue. He originally thought it would be a 3 Part walk but after careful consideration, he thinks it might be longer – we will have to wait and see. As usual, this walk comes with warnings of mud and uneven ground, so make sure you wear suitable clothing and sturdy boots. It’s child and dog friendly – as long as your children are up for a 10 mile hike. I’m not sure whether you’ve noticed, but things out there in the real world are looking pretty grim at the moment. The ongoing energy-sapping Brexit issue and Trump being a complete arse being significant contributory factors. So we all need cheering up, owing it to ourselves in an act of self-preservation to escape from all this misery. What better antidote to this fiasco than to lace up those boots, don our sensible winter clothing and take to the country for a good old ramble? So let’s put a full stop to the backstop, dump Trump and escape for a while. 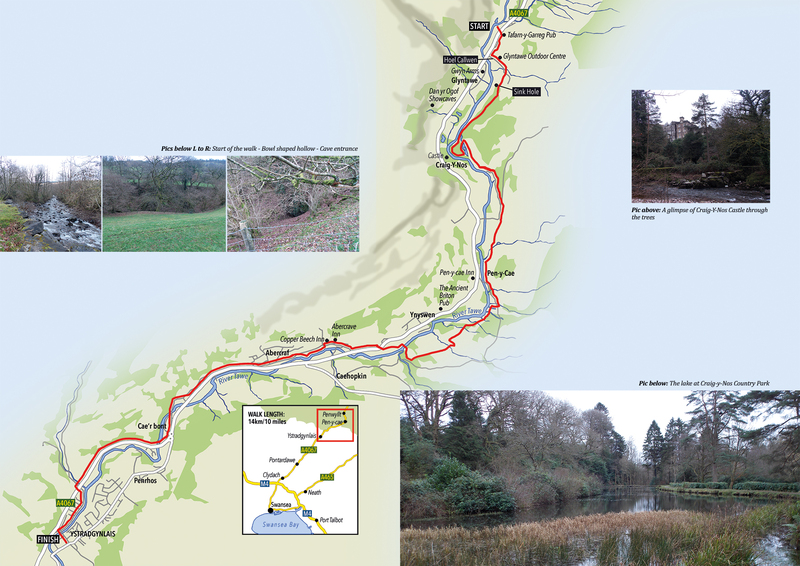 This month we’re going to continue our epic challenge of tracking the mighty River Tawe from source to mouth by completing the second section from the Tafarn y Garreg pub to Ystradgynlais. (If you recall, I did say we’d do it over 3 issues, but I’ve since come to realise that that was a tad ambitious even for us seasoned explorers). Needless to say, it’s a linear walk so you’ll need to make the appropriate transport arrangements to get to the start and for the end. I drove to Ystradgynlais, caught a bus to the pub and walked back. To make this option even more attractive to you, the bus ride is FREE on weekends (until further notice)! No charge. Dim arian required. I couldn’t believe my luck. It’s all part of a government sponsored scheme apparently (note to self: great idea for a bus based, Swansea Valley pub crawl) Alternatively, you could get a bus all the way from town to the start and catch the return from Ystradgynlais. Now, I know that catching a bus is an alien concept to most residents of SA2 and SA3, but don’t be frightened, be brave and just regard it as part of the adventure. To make you feel right at home, just simply pretend the driver’s your chauffeur and that you just happen to be sharing the journey with ordinary people. It worked for me. Alighting (to use bus parlance) at Tafarn Y Garreg, you’re now ready to start the walk. The map shows a path on the northern bank of the river but I couldn’t find it for the life of me so I took the easy option of simply walking back alongside the main road and turning left up Heol Callwen a few hundred yards along. Carry on up this road and just after the stream, take the stile to your right into a field where you’ll shortly pass a very curious large crater-like feature. I’m no expert, being probably the world’s worst geography graduate, but this had all the makings of a rather large sink hole, formed when the subterranean rock, carboniferous limestone, has eroded and weathered to such an extent that the surface collapses, creating this bowl-shape hollow. This non- expert view seems to be borne out by the fact that it’s also the entrance to a cave, another characteristic of limestone country (more of this below). Carry on this path and presently a gate will appear on your right, giving access to Craig y Nos Country Park below. It’s worth popping down there as it’s a very pleasing walk alongside the river with the imposing Craig y Nos castle serving as a backdrop. (return to this point once you have done so). It’s peaceful and quite melancholic along this stretch so definitely worthwhile, especially if you’re into peace and melancholy, man. You probably know the story about the castle – Adelina Patti a world famous Italian opera star bought the place at the height of her fame in 1878, spending the rest of her life there until she died in 1919. Incredible that a star of that magnitude – lauded by none other than the composer Guiseppe Verdi as the best singer of her age – chose to live in this part of the world. I suppose it’s a bit like Lady Gaga living in Ystradgynlais. The castle, which boasts its own theatre, has had a number of uses over the years, including a TB hospital, and now it’s a rather spectacular wedding venue. Rejoin the path which eventually merges with a tarmac road and you will notice that the view ahead opens up as the steep sided valley (Cribarth high to you right and Penwyllt to your left) gives way to a wider bowl-like appearance. 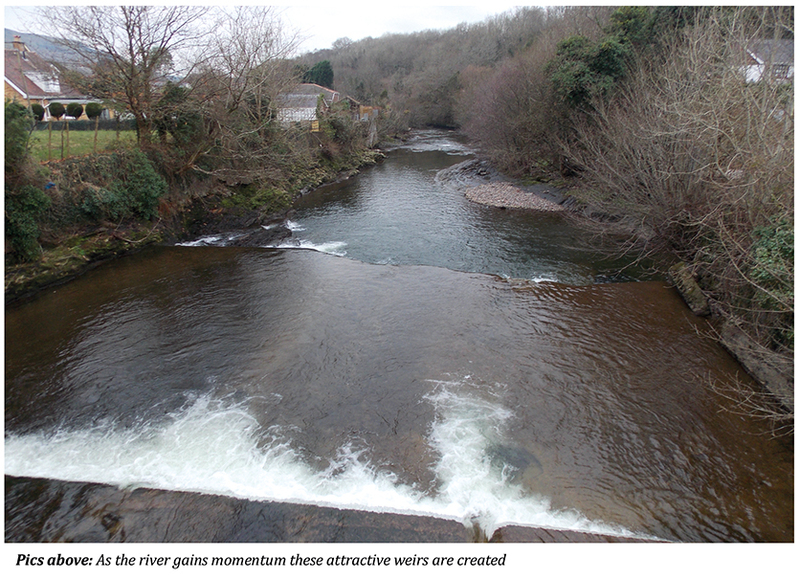 The river itself is still in its relative infancy, rapidly skipping along playfully and noisily in its narrow channel but it will of course grow in magnitude and slow down as it’s fed by its various tributaries further downstream. The lane will merge with a narrow road so bear right. After a short while it bends sharply to the right but you carry straight on following the bridle way sign. Again, you will join a tarmac road eventually turning left at a junction with the village of Pen y Cae just across the river to the right. Walk up the road and just before a chapel on your left, cross the stile on your right leading into a muddy field (I’ll wager that this could get a bit sticky after rain). Now I have to say, this section of the walk was a massive surprise. You find yourself hundreds of feet up, looking down at the river which has carved itself a meandering route into the precipitous cliff upon which you are now standing (warning – don’t go too close to the edge!!) It’s very impressive and reminded me a little bit of Symonds Yat as the river snakes its way along. Not as beautiful, granted, but a pretty damn fine effort nevertheless. I’ve often said that unless you walk the countryside, your impression of the surroundings is usually framed by the limited view from your car window and as a result you can miss out on so much. This is a perfect example. I’ve driven on this road hundreds of times over the years and I had absolutely no idea that this landscape existed just a few hundred yards away. Tidy mun. Carry on following the yellow markers and you will eventually pass a farm on your left, entering a rather strange looking field filled with the trunks of felled trees and collapsed dry stone walls. Cross over the wall to your left and look out for a stile up ahead in the corner of the field. Cross this and you’ll come to a couple of gates and a stile or two, also passing a barn and various farm buildings on your right. Turn right when you come to a road and after a hundred yards or so, follow the signpost to Abercrave to your right. Descend and cross a footbridge over the river and take an immediate left. This path will then take you back onto the main road at Abercrave. I have to admit, the next section of the walk isn’t great because it takes you alongside the road and whilst it’s relatively safe with wide pavements and grass verges, it’s far from perfect with high volumes of heavy traffic whizzing past. Not ideal, I know, but you can justify it if you regard it in the context of the contrasts in landscape and surroundings through which the river flows, which is the whole point of the exercise. You can avoid the road in two places. Firstly, turn right into the village of Abercrave just past the Abercrave Inn and beside a rather garish mustard coloured building. Take the path to the left which descends to the river bank. Follow this until it re-emerges onto the main road then further along, by the dome shaped building, there’s a path which straddles the river; whilst it re-joins the main road after only a couple of hundred yards it still gives you respite from the by-pass. At this stage you will notice that the character of the river itself has changed forever. Gone is the playful, exuberant, pretty youthful stream as it’s now morphed into a slower moving wider channelled more mature river, not unattractive I have to say, but its character and appearance has inevitably been affected by the man-made built up environment through which it now flows. Around here there’s further evidence of man’s influence, as sadly for the first time, there’s shocking evidence of our lazy throwaway culture as the river bank is strewn with the detritus of modern life; discarded drink cans, nappies, plastic bags and the like, most of it seemingly thrown out of the windows of moving cars. Nature (or God) gives us this beautiful planet on a plate and we just simply fail to give it the respect it so fully deserves. 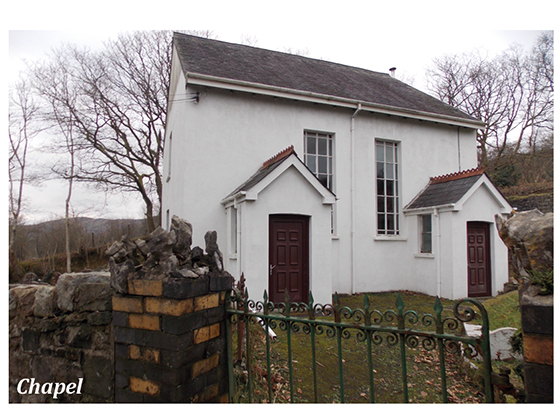 Follow the road to the lights at Cwmgiedd, acknowledging one of the Tawe’s major tributaries, Afon Giedd and follow the road to the left all the way back to Ystradgynlais, not forgetting of course, to call in to Lady Gaga’s for a cup of tea and a Welshcake.